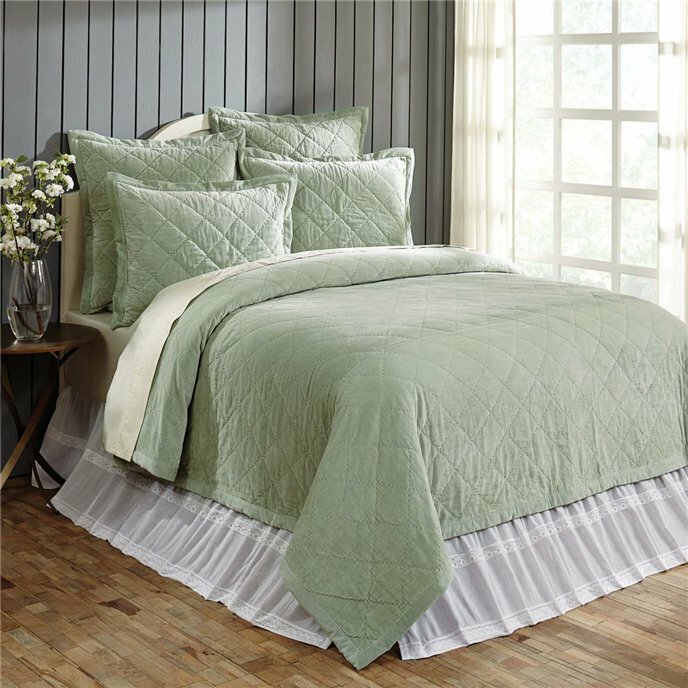 Lydia Sea Glass Quilt Collection - VHC Brands | P.C. Fallon Co. Simple luxury in wonderfully soft cotton velvet for an elegant statement in your decor. The Lydia Sea Glass quilt features on-point square hand-quilting on luxurious sea glass cotton velvet. A flat velvet flange trims the edges. The reverse of the quilt is a solid sea glass cotton cambric fabric. 100% cotton shell and batting. Layer shams in the same fabric and quilting for a serene setting. Hand wash cold, lay flat to dry. This item is imported. The Lydia Sea Glass queen quilt features on-point square hand-quilting on luxurious sea glass cotton velvet for an elegant, serene setting in your room. A flat velvet flange trims the edges. Reverse of the quilt is a solid sea glass cotton cambric fabric . 92"L x 92"W. 100% cotton shell and batting. Hand wash cold, lay flat to dry. This item is imported. Please note, colors may appear differently in different resolutions and on different computers. Manufacturer's UPC code is 840528157721. The Lydia Sea Glass king quilt features on-point square hand-quilting on luxurious sea glass cotton velvet for an elegant, serene setting in your room. A flat velvet flange trims the edges. Reverse of the quilt is a solid sea glass cotton cambric fabric . 92"L x 108"W. 100% cotton shell and batting. Hand wash cold, lay flat to dry. This item is imported. Please note, colors may appear differently in different resolutions and on different computers. Manufacturer's UPC code is 840528157714. The Lydia Sea Glass standard sham features on-point square hand-quilting on luxurious sea glass cotton velvet. The sham is bordered by a 1.5" velvet flat flange. The back is a solid sea glass cotton cambric fabric with 3 tie closures and a 3" overlap. Measures 21" x 27". 100% cotton. Hand wash cold, lay flat to dry. This item is imported. Please note, colors may appear differently in different resolutions and on different computers. Manufacturer's UPC code is 840528157752. The Lydia Sea Glass King sham features on-point square hand-quilting on luxurious sea glass cotton velvet. The sham is bordered by a 1.5" velvet flat flange. The back is a solid sea glass cotton cambric fabric with 3 tie closures and a 3" overlap. Measures 21" x 37". 100% cotton. Hand wash cold, lay flat to dry. This item is imported. Please note, colors may appear differently in different resolutions and on different computers. Manufacturer's UPC code is 840528157745.